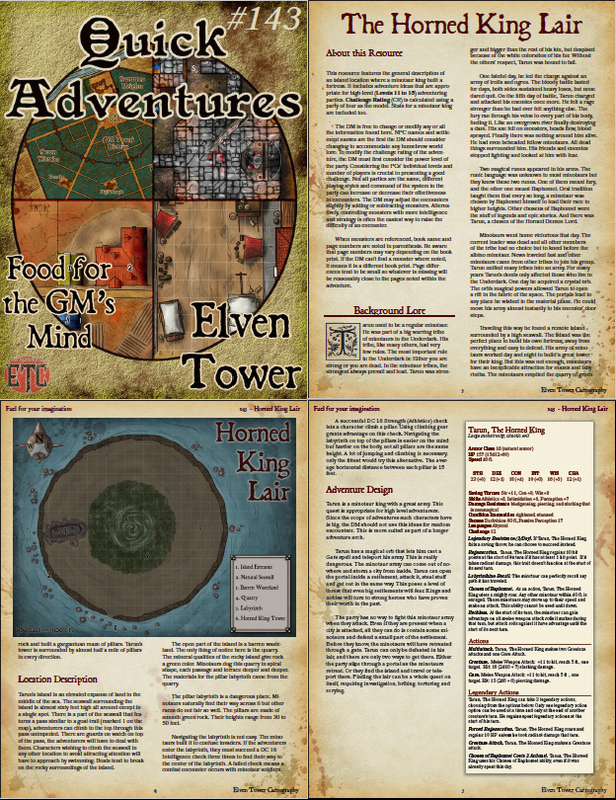 Adventure available in PDF for Patreon subscribers. This resource features the general description of Vennim City a coastal city settled right on a river. It includes adventure ideas that are easily scaled for different kinds of adventures. Since the scope of the adventure ideas is local, they are appropriate for low to mid-level (Levels 1 to 10) adventuring parties. Challenge Rating (CR) is calculated using a party of four as the model. Vennim City, they call it the jewel of the south because it is the only successful city on the lower part of the continent. Other bigger settlements have been abandoned or lost to wars. The countryside is dotted with smaller towns and hamlets; minuscule points of light in the harsh lands. The country is a poor one, except for the capital. Roads are dangerous, most people die in the same place they were born because traveling is expensive and dangerous. Bad men and sellswords roam the lands looking for easy prey, and when they do get some gold to spend, they always go and spend it all in Vennim City. You can find it all in Vennim City, but the one thing that shines brighter is the playhouses. Money games and betting are the sources of the city’s wealth; there are enough places to visit every week and never run out of. The nobles visit the wealthy playhouses where bets are paid in gold ingots, precious stones and sometimes exotic animals and spices. The populace visits more affordable and discreet playhouses, they spend their wages in games and nights of fun. From time to time a good hand or good dice come and they bet big and go home with a small fortune, often barely making up the loses of past game nights. Even the lowest of townsfolk, the working class, farmers, and beggars find backroom alleys where they bet big on copper pieces and tomorrow’s meals. No one is impervious to the gambling industry in Vennim City. The playhouses are controlled by powerful factions inside the city. Most people have something to do with the business in one way or another. Either people are players or they work for the playhouses or the factions controlling them. Every person a pawn in the bigger scheme of things in the city. There are two powerful factions that control more than half of the games that happen in Vennim City. The Turtle Necks, which control the city council; and the Golden Cloaks, whose leader is the town minister himself. These two warring factions wage turf wars all year round. 1. Vennim’s Heights.- One of the oldest wards of Vennim City. It is protected by the first stretch of the wall built for the city’s defense. The richest noble houses all have estates here, as well as the most prominent merchants and play house owners. Places of interest are Castle Plancert, where Duke Earldom lives. And The Blue Lagoon, which is the most exclusive playhouse in Vennim City. Admittance only with an invitation. 2. Oldtown ward.- Just under Vennim Heights’ hill is the old downtown of the city. It used to be a poorer neighborhood decades back but with the city’s growth, it’s grown in the noble’s favor due to its closeness to the most reputable ward in the city. Most places here were rebuilt as large house estates. While Vennim’s Heights is crowded and expensive, the Oldtown Ward is spacious and just as expensive. It is mostly populated with large manor houses for the wealthy houses. 3. Sunflower Ward.- Not popular with the nobles as of late, this ward is falling in its accommodations. Over the last few years, it’s seen a repopulation of merchants and workers. The playhouses in the ward were forced to lower their standards to the very different type of public to survive. It is still a place where one can experience a better than normal night in town. 4. Clergy’s Ward.- Decades ago the churches had more power in Vennim City. The leader of each faith had guaranteed a spot in council for an appointee. With such influence, they secured the construction of a wall to surround the clergy district, not that there is any trouble getting in or out. The important churches and the accommodations for their members and workers are all here. 5. Grey Market Ward.- This district is mostly residential homes. The main feature of it is the Grey Market. It is the biggest place of commerce in the city. Scores of shops open their doors every day. Even more, street vendors and cart vendors show their wares to locals and visitors and offer the best prices in town. 6. Vanity Grounds.- The biggest ward in town is home to all kinds of people but it is overall a poor neighborhood. Some places are nicer than others, particularly the blocks near the main streets, where the shops, inns, bazaars, and playhouses are. Visitors will most likely see this face of the city on their first visit. Places of interest are Glowater Inn, Penniless Estate, The Clock (playhouse) and the House of Pink (brothel). 7. Yellow Ward.- The Yellow Ward is a small state in itself. It features a great number of barracks, training houses, the prison and Castle Westinside. The Ward was designed as a defensive bastion in case of war or invasion. It is the most defensible place in town. 8. Sapphire Ward.- The growth of Vennim City eventually demanded the creation of another high-class neighborhood. New nobles and wealthy merchants moving into Vennim City find little luck settling in Venim Heights or the Oldtown ward, those places are full and no one is selling. Thus Sapphire Ward was created, it is nowhere as exclusive as the places mentioned but it serves its purpose. It has a big disadvantage when compared to other wards; since it is next to the outer wall an invasion of siege is a real concern with so many enemies. 9. Seaward.- The Seaward district is just as old as Vennim Heights. It has always been the poorest part of town. It is stacked with small houses for workers, fishermen, and vendors who can’t afford to live better in the city. Play houses do not open shop here; instead, people gather in private and play at home, fancying themselves in the big playing rooms. A great number of townsfolk work at the docks. 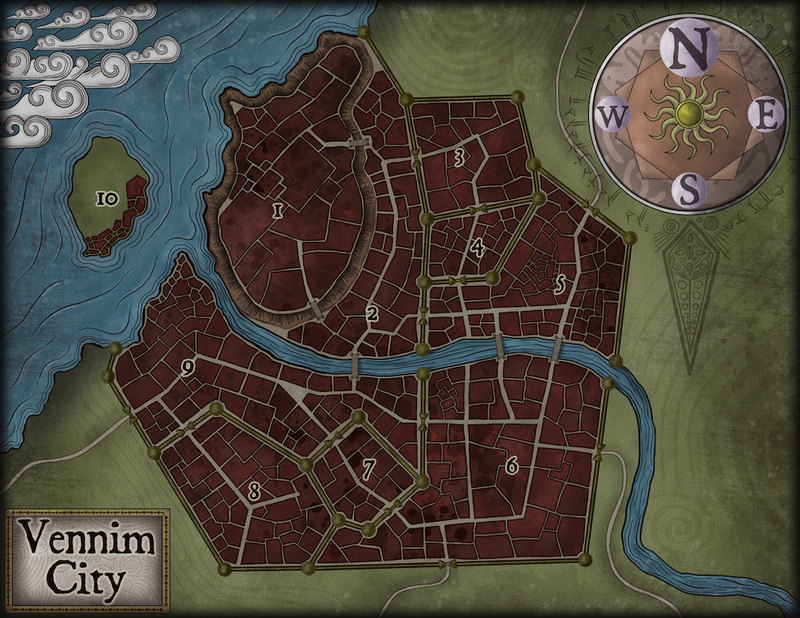 Vennim City has plenty of trading deals with other coastal settlements and smaller towns upriver. 10. Lighthouse Fair.- Contrary to its name, the ward is not a fair. It is, in fact, a humble fishing neighborhood. Ferries travel from the island to Seaward twice a day. There is a small fort with a permanent garrison and a lighthouse. Terrance Goldman is the city’s minister and the leader of the Golden Cloaks. He leads from his luxurious mansion in Venim Heights unquestioned. He recently heard of a secret shipment of gold ingots to be delivered to his enemies, the Turtle Necks. He is willing to hire sellswords to take over that shipment. Laura Diamondtooth is a higher up in the Turtle Necks faction. She is charged with taking care of their three big playhouses. She recently received a handsome bribe and will change sides. She knows the codes to the vaults that guard the playhouses’ gold; she is willing to rob them before getting away. She’ll need extra muscle to pull off this heist. The Blue Lagoon is the most exclusive location in Vennim city. Adventurers will not be able to gain access without producing an invitation and dressing in fine garments. Even if they manage that, the entry price for gambling here is 500 gold pieces. The House of Pink is not the only brothel in Vennim City but it is the most famous one. The owner is a harsh, cruel man known as Jackie Mouse. He is in big trouble now. A married wealthy noble who is a recurring visitor was killed in the room. The young prostitute that was with him ran away and no one really knows what happened exactly. Jackie Mouse is hiring muscle to find the girl, he means to use any tool necessary to extract the truth from her. Fabio is an accomplished burglar enjoying the riches of living in a big gambling city. He is good with his hands and usually finds odd jobs dealing cards and dice in other people’s games. He is doing a heist at The Clock, a popular playhouse in Vanity Grounds. He stole a small quantity of very high valued gambling chips that he plans on reselling later. If he is about to get caught, he might plant the chips in someone else’s bag to avoid punishment. There’s a dark alley in the Grey Market named Saffron Street. Hooded street peddlers sell a popular substance to addicted victims. The effects of the clear liquid they sell are strong and last for a few hours. The Turtle Necks are behind this operation. Should their involvement be disclosed to the council, they would lose footing there. Vennim City has an efficient way to deal with criminals and homeless townsfolk. The guards bring them to prison in the Yellow Ward. After a few days, they are processed and sent to the barracks for mandatory training and service for the city. Vennim City never has a shortage of soldiers and guards because of this. Whenever prisoners resist old fashioned persuasion, the city guard uses one of two methods. They can commission a priest to force a criminal into service via a divine promise (Geas Spell). Alternatively, the city’s tinkerers came up with an efficient solution. They crafted ankle bracelets with a strong alloy of platinum and iron. The bracelets include an explosive charge. Should a soldier defect or refuse an order, platoon leaders and commanders can make their legs blow up in pieces with a command word. After the first soldier who refused and had his legs blown up, none has dared disobey. The Turtle Necks leader, Vladimir Slekonkoff, is planning to take over the city’ council by force. They have been preparing this operation since last year. The main part of this plan is to call for an emergency council session to discuss the city’s response to an incoming attack. The reports of an approaching army from the south are fake. During the council session, Lord Vladimir plans on having his men kill all his opposing bureaucrats. Since Vladimir’s men are known to his rivals, he is currently hiring new blood to accomplish his goals. Alternatively, if Vladimir’s rivals have been tipped off, then they will be hiring help.